Here is a clip from MotherJones about the Obama’s new vege garden. Michelle Obama: We’re also working on a wonderful new garden project. Michelle Obama: We want to use it as a point of education, to talk about health and how delicious it is to eat fresh food, and how you can take that food and make it part of a healthy diet. You know, the tomato that’s from your garden tastes very different from one that isn’t. And peas – what is it like to eat peas in season? So we want the White House to be a place of education and awareness. And hopefully kids will be interested because there are kids living here. But it is certainly worth a try. I spent a large portion of my Vermont childhood picking pesticide-free beans and chards, so I understand a direct relationship with vegetables and dirt helps people understand what food is and what we put into our bodies. I appreciate that Obama is trying. And who knows, with 18 acres to farm and only five mouths to feed, the White House will surely produce a surplus. Maybe 1600 Pennsylvania Ave will turn out some good tomatoes for DC to eat. family will encourage Americans to give up those wasteful lawns and plant gardens again, thus diminishing American fossil fuel usage and unhealthy agricultural practices. practical. Michael Pollan, a longtime proponent of turning acres of the White House into a garden, once requested a list of pesticides used on the grounds. He was refused. But vegetable gardens at the White House are nothing new. John Adams, the building’s first resident, added one in 1800. By the early twentieth century the West end of the White House (where the Oval Office is today) consisted of a rambling series of greenhouses that supplied plants to the president’s family all year round. The Obama garden would not be the first time the president’s family used the grounds to lend a hand to the nation, either. Woodrow Wilson let sheep graze on the South Lawn to produce wool during World War I. Eleanor Roosevelt planted a victory garden in 1943. Even more recently, Jimmy Carter planted herbs between the flowers. Since the Clinton administration, the staff has harvested food from a vegetable garden on the roof. The new garden is a nice idea, but it runs the risk of coming off a little hollow, since the White House is famous for toothless token gestures. When Jacqueline Kennedy wanted to express concern about poverty in West Virginia, she ordered new White House glasses from the Morgantown Glassware factory. The company still closed in 1971, and West Virginia continues to have the third lowest per capita income in the country. 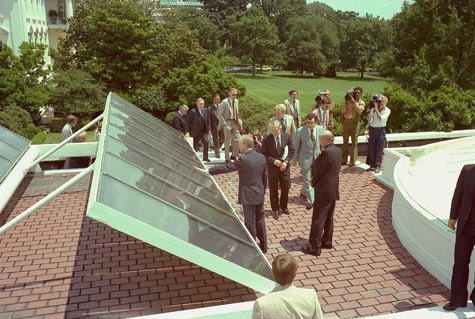 Later, President Carter installed solar panels, an energy solution wildly outside of the average American’s price range, during the energy crisis, a move critics panned extensively. Reagan removed the solar panels immediately after he moved in. Symbolic changes in the White House only work when accompanied by effective policy fixes. Let’s see what happens the next time the farm bill rolls around. At this point an Obama-led food revolution is doubtful, particularly given the president’s selection of agribusiness-crony Tom Vilsack as agriculture secretary.